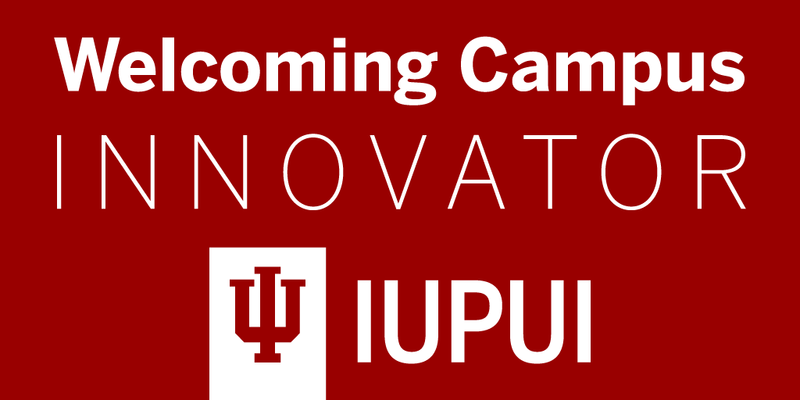 In the second round of Welcoming Campus Innovator funding, twenty-two projects from units across IUPUI received more than $400,000 in grants. The projects are currently being developed and will be showcased during IUPUI's 50th Anniversary (2018-19) and beyond. The proposals support Welcoming Campus Initiative themes, which you can see below. Projects supporting this theme result in experiences and approaches that foster greater connection with IUPUI through greater understanding of who we are as a campus. University Archives, the Public History and Media Arts and Science Programs, and The Polis Center are collaborating on an interactive timeline that contains the building blocks for IUPUI’s institutional memory. The White Racial Literacy Project provides an educational environment and reflective opportunity for white people within the IUPUI community to unpack misconceptions and misinformation about structural racism. Projects supporting this theme contribute to IUPUI’s goals for student success by focusing on ways in which IUPUI can create a more welcoming campus for students and strengthen students’ sense of connectedness and belonging. The Japanese Studies Program and Japanese Culture Club will host the Japanese Olympiad of Indiana (JOI) in February 2019 at the IUPUI Campus Center. The main goal of this project is to give the dance organizations on campus an opportunity to showcase their work to the entire campus, build strong partnerships amongst the dance organizations on campus, and celebrate the art of dance. Additional funding for the mission of SAAB--Student African-American Brotherhood to support and enhance student experiences of inclusiveness of undergraduate African-American males. The proposed welcoming experience offers students the opportunity to represent IUPUI in intercollegiate competitions through their involvement in the design and fabrication of robots and vehicles. Our initiative seeks to reduce these barriers through: advisor training workshops to shift how we discuss mathematics; a campaign of positive math messaging; peer-led study groups; and assessment of attitudes toward math. The team aims to provide a welcome to the campus community through online modules given between orientation and the start of classes that will allow students to engage with the community. They also plan to hold a one-day institute focused on examining the various issues involved with helping University College students feel welcome in their intended degree-granting schools from day one and developing action plans schools will commit to in addressing these issues. The “Get UPnGO” initiative proposed by the Underrepresented Professional and Graduate Student Organization (UPnGO) will help advance the theme “Creating a Vibrant and Inclusive Student Experience” by providing student-led recruitment and retention efforts as well as offering events and programming to address issues pertinent to student success. The ROAR for 5 challenge is all about building spirit and loyalty for the IUPUI Jaguars. Participation in this project helps us celebrate IUPUI’s 50th Anniversary Year by increasing home game attendance to create a true Division 1 NCAA experience for all involved while creating a better over-all student experience. Through this project we will develop a video series featuring IUPUI students sharing the challenges they faced upon entering college, how they worked through those challenges, and a brief introduction to the concept of growth-mindset (Dweck, 2007). The Social Justice Achievers (SJA) Ambassador and Mentoring Project program seeks to provide support through mentoring, leadership development, and intergroup dialogue training for underrepresented students in the undergraduate programs of the IU School of Social Work and School (IUSSW) of Public and Environmental Affairs (SPEA) who may face barriers to securing professional work and/or pursuing a graduate degree. Goals for this project include strengthening sophomore students’ connectedness and belonging while working towards IUPUI’s goals for student success and retention. This project aims to enhance the beloved campus tradition of the IUPUI Regatta by bringing the event closer to home, both in a physical and communal sense. Projects supporting this theme promote pride and engagement through activities and enhancements to IUPUI’s physical space, such as improving campus navigation on and off campus, developing campus art fund, and identifying ways for students to have more interactions with faculty, staff, and administrators. The project will install educational signage and web-link electronic tags on trees and iconic landmarks along a 2.3-mile greenway that forms the western edge of the IUPUI campus to provide visitors with information about the area’s history, vegetation, wildlife, and the continuing evolution of the IUPUI peninsula. Projects supporting this theme foster connections within IUPUI and the broader community through events and activities that promote engagement. The team aims to bring together voices from the university and the community to engage in a conversation around the significance of working collaboratively to strengthen the region with an educated workforce. The Center for Public Health Practice will engage students in service-learning and leadership activities while encouraging further integration with the surrounding Indianapolis community. Overall goal: Build key technical and institutional infrastructure that will result in better data to inform decisions about how community engagement efforts can be more strategic, coordinated, effective, and responsive to community issues. In partnership with Family, School, and Neighborhood Engagement and community partners (Indianapolis Public Schools and Indianapolis Freedom School Partnership), the IUPUI School of Education will operate a Children’s Defense Fund Freedom School. The IUPUI 50th Anniversary Community Service Projects team is working with the Near West neighborhood committees to identify potential service projects that could be completed during academic year 2018-19 that would align with the community’s priorities. Projects supporting this theme demonstrate strategies and approaches that can foster ongoing commitment by employees to IUPUI as well as by IUPUI to its employees. Creating Campus Change (C3) is a professional development series for LGBTQ+ graduate/professional students, staff and faculty. This year-long series seeks to build a sense of community as well as meeting the personal and professional development needs of LGBTQ+ people in higher education. This project aims to contribute to the creation of such a cultural shift by focusing on two intersecting goals: Intentionally infusing diversity and global-mindedness throughout the college curriculum with a focus on high impact practices and engaged learning; and equipping our faculty/staff to be agents of change and culturally competent through diversity/intercultural training and professional development workshops.